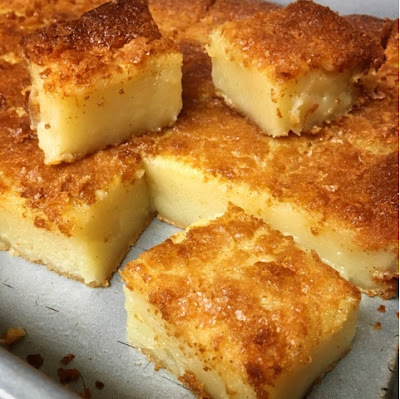 Hawaii Mom Blog: I Love This Butter Mochi Recipe! First off, this recipe makes a lot of butter mochi and is actually the first recipe I have seen that does not call for coconut milk. This is my friend's recipe and it is awesome! Get a large bowl out because you are going to need it. Mix together 4 cups of mochiko (FYI, this is more than one box), 2 1/2 cups sugar, 3 tsp baking powder, 4 cups milk, 4 eggs, and 2 tsp vanilla. Feel free to sub a cup of coconut milk for regular milk. Add 1 block of melted butter to the mixture. Bake in a greased 9x13 pan at 325 degrees for 1 hour and 30 minutes or until edges are brown. You may want to put a cookie sheet under the pan to catch any butter drippings. My oven is still waiting to be cleaned up. Cool. Cut. Eat. Enjoy! 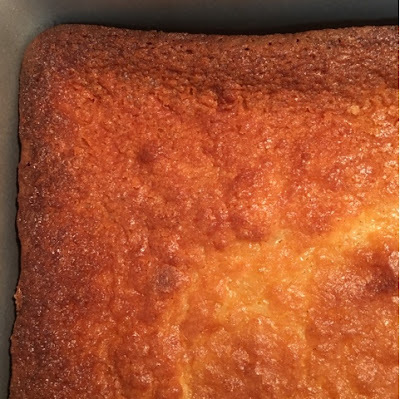 Thanks Susan F. for passing on this awesome butter mochi recipe! Do you think it would be ok to cut the recipe n half? Definitely! I did just that the first time because I was thinking 4 cups of milk is a huge commitment. I can't remember if I still used a 9x13 pan, but I think it should be fine. The mochi will just not be as high. I live in Sweden now, been away from HI nearly 10 yrs now. How many ounces or grams is a block of butter? I'll have to see who sells Mochi flour. Otherwise I'll have to wait until I'm back in HI next yr, lol! Aloha Lc! One block is half a cup; 4 ounces. Good luck! Hope you like it! Just made this and it's amazing! Thank you. Yay! Glad you gave it a try! What is Mochiko? Is it rice flour? Yes - a sweet rice flour. Sounds delicious! Do you use the coconut milk? Just curious how it changes the taste and/or texture. I had a friend that subbed one cup of coconut milk and she loved it! Don't think it changed the texture. Thank you! Going to try to make it for the New Year. Thank you for this yummy recipe! So easy and it came out perfectly! I used one can of coconut milk. Brought it to a family picnic and not a single piece was left! Will definitely make again! Sub rice flour for coconut flour? Sorry, we've never tried that. What is mochiko and where do you buy it?